Smith Mountain Lake was created to generate electricity, by the damming of the Blackwater and Roanoke Rivers. The filling process that began in 1963 and ended almost 3 years later in March of 1966. Smith Mountain lakes highest normal water level is 795 feet above sea level, which is full pond There is typically very little seasonal variation in the water level. The water level fluctuates about 12-24 inches daily. During the summer the water could get as low as 5 feet. Even in these types of conditions,you dont have to worry about running aground in the main channel of the lake. Smith Mountain Lakes deepest point is at the Smith Mountain Dam. ranging around 240 – 250ft feet. The average depth of Smith Mountain Lake is about 60-90ft, but there are many areas well over 100ft. Smith Mountain Lake is a fairly deep lake,producing cold water down deep, perfect for Striped Bass, and many other species of fish, like Largemouth Bass, Smallmouth Bass, Crappie,Sun Fish,Catfish, Walleye,Muskie,Perch, and White Bass. 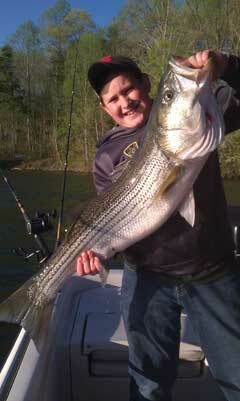 Smith Mountain Lake is known for Striped Bass Fishing. You can go out anytime of the year and catch Striped Bass on Smith Mountain Lake. I would recommend that you experience Striper fishing with a professional Striper guide during your first visit. I will show you the ropes of Striper fishing on Smith Mountain Lake. When your finished with your successful Fishing Charter, you can then enjoy the rest of your day,cruising the lake on a rented boat, from Westlake Boat Rentals. It is a all in one package, if you stay at the Westlake Waterfront Inn. ( Place to stay on Smith Mountain Lake, Boat and Jetski Rentals,and a Professional Fishing Charter Service). Perfect for a Smith Mountain Lake get away! Smith Mountain Lake has about 17,000-18,000 permanent residents. Three counties surrounds Smith Mountain Lake, the three counties includes the town of Pittsylvania, Bedford, and Franklin. The cities of Roanoke and Lynchburg are located about 30 minutes away.